When you’ve hiked in a place several times, and you love that place, and maybe even have made up your own names for features you always see along the trail in that place, you can actually get the idea that you’ve really seen that place. Then you’ll notice something you didn’t see before, and you realize you’ve only seen bits and pieces. Take Piestewa Peak. 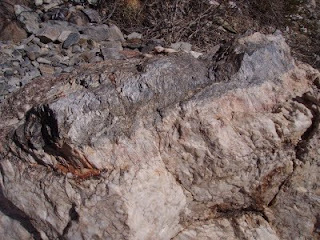 You can make some assumptions about that mountain and its close neighbors based on the rocks you see, many of which are metamorphic. 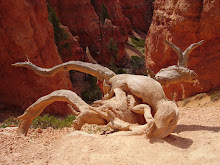 They have been squeezed and fractured, melted and re-crystalized, weathered and then colonized by plant and animal life. At some point, tons and tons of weight rested on them, they are the remnants of a mountain range. It has slowly crumbled and created some of the “valley fill” that hides the grabens (“pull-apart” faults) and low spots in the Basin & Range areas of Arizona. And you can tell the area was under water for many millions of years, prior to and after the mountain-building stages. 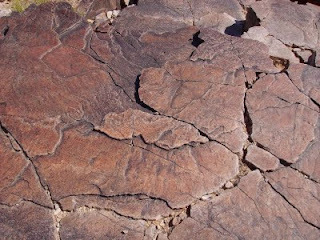 Fossils all over Arizona testify to that fact, as does the presence of limestone and other sedimentary rocks. If you look at the entire Western United States you can see the train-wreck mountain ranges that run from Alaska to Mexico, the result of the counter-clockwise, Northwest shifting of North America after it broke away from the last supercontinent and plowed into Island chains, making them part of the continent. During that shift, Arizona overrode some very hot spots in the mantle, and melted stuff was forced up into cracks in fractured rocks to give us copper, quartz, and lots of other interesting metals and gems. Those hot spots also generated lots of volcanic activity, so you see all kinds of magma, both light and dark, in fractured “necks” that cooled below the ground and then were exposed by erosion, and in collapsed craters that exploded and hurled rocky projectiles hundred of miles around. You can see the remnants of pyroclastic flows made of ash and melted stuff that scooped up rock debris as it flowed at top speeds across the landscape. And you can see that flowing water, blowing winds, human construction, and even plants and animals have moved rocks and sand far from their place or origin. When Ernie and I first hiked Piestewa Peak last year, I observed the tilted stratification and wondered if it may have been the result of the Laramide Orogeny (“mountain-building period”), which is thought to have begun around 75 million years ago, and is also thought to have lasted up to 25 million years. And yes, that may have created the old mountain range that squished those metamorphic rocks in the first place. But now I wonder if something else pushed those layers up and out. Some of them seem to go almost vertical. Could super-hot stuff boiling up underneath have shoved those layers up? This is one of the questions with which I plan to pester the geology gurus when I pursue my degree in 2010. But, mysterious as the geological history of Arizona may be, it’s not even the mystery that caught my attention last Friday, when Ernie and I took advantage of the cool weather to go hiking on our favorite Phoenix trail. We were headed for a spot we think of as The Secret Canyon, where a higher group of rocks sticking out of the mountains looks out over a wider, deeper spot in an arroyo. It’s no Grand Canyon, it’s not even an Oak Creek Canyon. But it’s a magical spot, where the wind blows and on some lucky days you can’t hear the sounds of town at all. Hikers like to pause at that spot and nibble trail food, sip water, talk about their dreams. There’s a memorial bench up there that will bring tears to your eyes if you pause to read the dedication plaque. 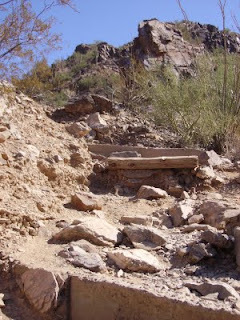 I think of it as the heart of Piestewa Peak, though many others believe the Summit Trail is that spot. I brought my camera up there this time, hoping to capture even a fraction of the spirit of the place. Someone or something jammed a rock into that hole. 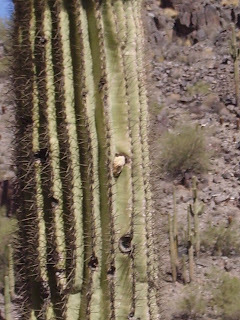 And when we stopped to really look, we could see that several of the saguaros had similar rocks stuck in them. All of these were high off the ground, all stuck firmly into their holes. Many were the same size as the hole, but there were even a few big rocks, maybe the size (though not the shape) of oranges, that were also stuck fast. I remembered the photo I had taken of the Zombie Saguaro a few months back, and he had a rock in his mouth that looked like a tongue. I had assumed some wise guy hiker had put it there. But these other rocks were too high up for a human to stick them in the holes, and if they had been thrown, they would probably just have bounced off. You’d have to stay there a long time, patiently throwing rocks at those tiny holes in order to get one to stick, and that’s not why people are on that path in the first place– they’re just out getting exercise and enjoying the view! Plus many of the saguaros weren’t even accessible to foot traffic. Once we noticed the rocks, we realized dozens of the saguaros had them. Some of those rocks may have been there a hundred years. Unless gravity and wind and rain dislodge them, they may be there a hundred more. 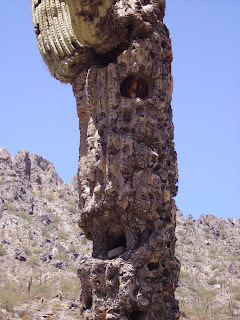 So the next time you’re out hiking and you see a saguaro, look for the rocks. Yeah, it’s not the biggest mystery out there, but it made me stop and wonder what else I’m not seeing. That, alone, makes it worth pondering. 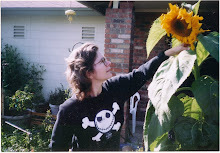 And please – let me know if you spot the saguaro gremlin that’s responsible. hello. sorry for communicating through a blog comment, but i'm not what you would call computer savvy. i was just wondering if there would ever be a followup to Enemies. i'm sorry to say i found it in a dollar store, but it was one of the best book i've ever read. shortly after, i read Belarus, which might be even better, if you don't mind me saying. 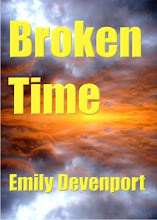 and thru that one i found broken time, which is also great. if you feel like responding in this silly way, thank you. 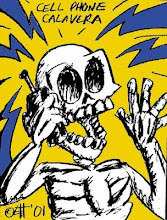 Your method of communication actually works well for me. 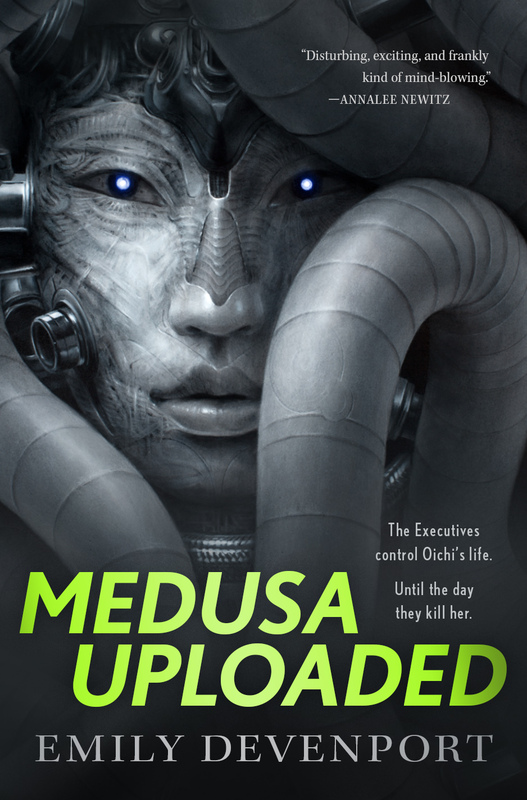 The answer to whether I intend to write a sequel to ENEMIES is: yes -- sort of. I don't have a relationship with my old publisher anymore (though such things can change unexpectedly). 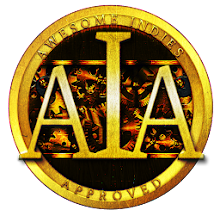 I plan to set up my own fiction website, where some stories are offered for free and books are offered as inexpensive audio books and/or $1 e-books. I had originally planned to write two books after ENEMIES, one of which would have been about the Egyptian-themed world Canopus (titled HARPY). The other book would have grown out of the action from ENEMIES. I think both of these books will happen, but they may take me a few years to write. 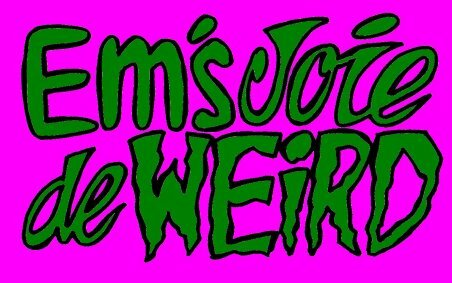 In the meantime, I hope to entertain you with some other new titles, soon. I suspect you'll find that many (if not all) of your favorite writers will be selling their books to you through their own websites within the next five years or so (maybe sooner). The up side is that cost will probably go down. I used to make around 35 cents per book when I sold through my publisher, so at $1 a book, I'm actually getting a raise. that is great news, and if what you say is true, then it really is better for everyone. i am excited to read your new material, whenever and however it's published. i thank you for your time and creativity. Hey! That's the rock I threw in that cactus. Now that's funny. 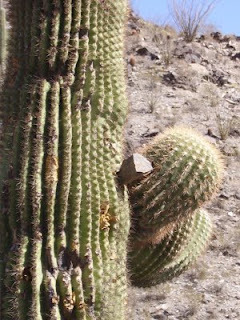 The first time I ever saw a saguaro, when I was moving back to Dallas from Portland at the end of 1997, I found one of those rocks in it, at about eye level. Big one, too, about the size of my fist, and nicely rounded. We were at a gas station/tourist center along I-10, and I at first figured that some moron tourist had jammed it in there. Problem was, it was far too smooth to be just stuck into the cactus's extremely tough skin (I saw where people had tried to carve their names into the skin and failed), and the skin had started to grow over the rock. 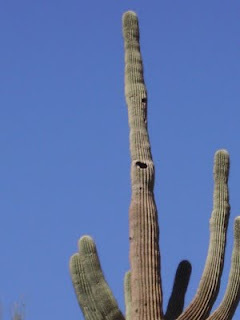 Knowing what I knew then about the saguaro's lifespan, and the fact that cacti grow up and out from their tips, precluding that rock originally having been on the ground, it was a mystery to me, too. And now you tell me that this is happening all over the place. Now I'm curious as to what's behind the rocks. We might have found where Gila monsters lay their eggs in the wild. Ahah! Someone else has noticed! I've lived here 46 years, and I didn't see the rocks stuck in the saguaros until Ernie pointed them out to me. My eyes have been opened, but the mystery remains . . .